Ivry sur Seine, lies like Montreuil, just outside the Boulevard Périphérique. Its location along the Seine has created an extensive industrial zone between the river and the railway line that runs from Paris to the southeast of France. This industrial zone is still functioning. 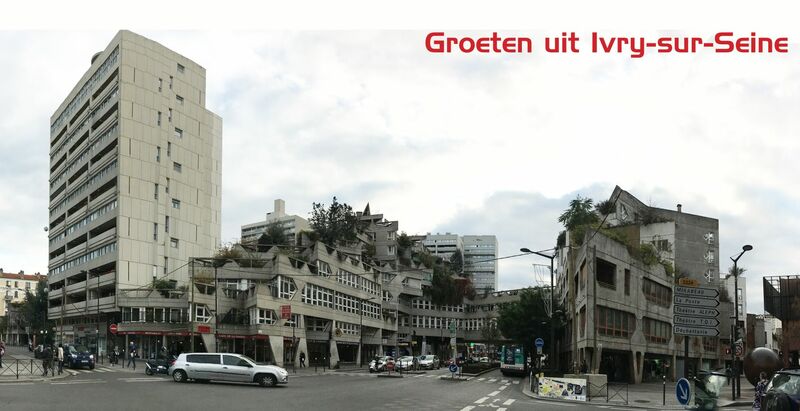 The center of Ivry has been considerably changed in the 70s. Several architects with great modernist ambitions, have designed a new centre. The most striking project is Les Etoiles from 1972, designed by Jean Renaudie. A project with a raised ground level, stacked terrace houses and integrated commercial facilities. Renaudie really liked triangles, which form the basis for the housing plans. And that works surprisingly well. Interesting is that the project is not only the centre of the city with its good public facilities and commercial spaces in de plinth, but also has provided great housing, that offers a world of its own. A kind of Bjerget (BIG, 2008) but without the liveless plinth. The triangle as a shape does not form an obstacle, but is inventively used by Renaudie to fit the complex into the context.